Dr Josephine Igoe has extensive lecturing and examining experience across a range of management modules, having taught in the University of Limerick for 10 years, before joining the Discipline of Management at NUI Galway in 2004. Josephine lectures in the field of Strategic Management and Global Business at NUI Galway. Having completed her previous degrees at University College Dublin and Smurfit Graduate School of Business, Josephine completed her PhD at University of Warwick (UK), which examined self-interested and guided strategic subsidiary evolution through subsidiary management initiatives, in a longitudinal study of multinationals operating in the ICT and Medical Technology sectors in Ireland. Josephine has held the position of MSc Academic Programme Director for almost 10 years, previously serving as Programme Director of the MSc Strategy, Innovation and People Management and currently serves as Programme Director of the award-winning MSc International Management. She was External Examiner at Sligo Institute of Technology for a four year period from 2011-2015. 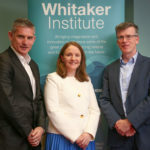 She is currently External Examiner for and has acted as peer-evaluator on introduction of new postgraduate programmes in International Business at Waterford Institute of Technology. Josephine's research and teaching interests revolve around innovation and capability development within multinational organisations, particularly high-technology multinationals, with a focus on multinational global strategy, headquarter-subsidiary dynamics and cross-national subsidiary evolution dynamics. Josephine is actively involved in both national and international networks researching key issues surrounding innovation and growth in multinational organisations in a global environment. She is a member and reviewer for Academy of International Business and European International Business Association. Josephine teaches Global Business and Strategic Management at undergraduate and postgraduate levels. The evolutionary role of subsidiaries with foci on subsidiary technology development, subsidiary autonomy, and subsidiary strategy and initiative. Technological change and the transfer of technology in international MNE networks for innovation- focus on subsidiary specific advantage creation. The networked multinational, in particular, the technological learning/sharing process in the MNE networks. (1995) Case Studies in Public Service Management (Instructors Manual).